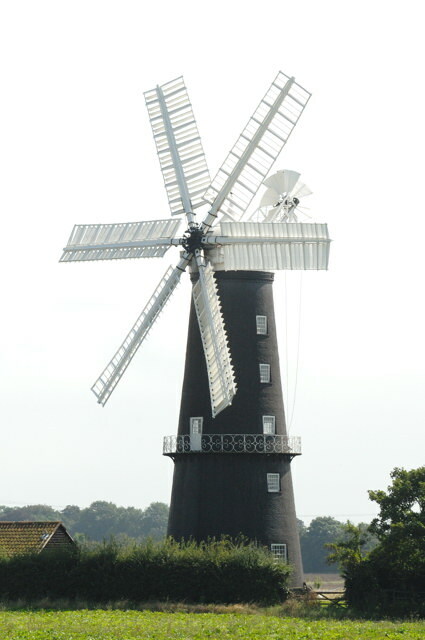 This tower mill is 74 feet 3 inches to the top of the cap, but appears taller due to being thinner than many others. 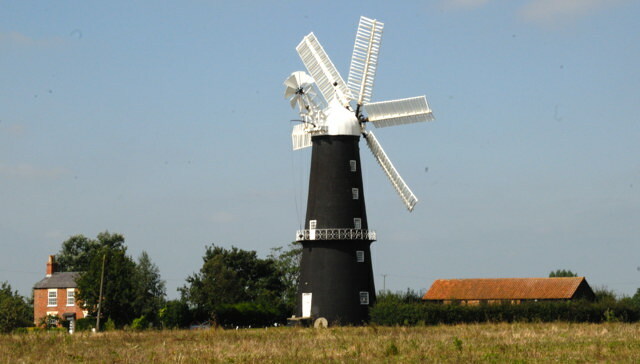 It was built by Saunderson of Louth in 1877 to replace a small post mill. It has six floors above ground. It has six large sails. It worked until 1954, towards the end with four sails. It then become derelict. It was restored in 1970 to 'static' condition by the Department of the Environment. In 1981 they got the mill into full working order and the fantail working. The ground floor is now nearly empty the equipment having been removed. The first floor contains the tentering gear and spouts. The second floor gives access to the very ornate iron stage (seen on the outside in the pictures) and contains the three remaining pairs of stones of the four pairs originally fitted. The great spur wheel is of iron on an iron upright shaft and drives through mortice stone nuts. The third and fourth floors are both bin floors although no bins remain, you just see holes in the floor. The fifth floor is the dust floor and contains the iron sack hoist with an endless chain. The brake wheel and wallower are of iron, as are the brake and brake lever. This would be one of my top ten windmills to photograph in Britain. This is a picturesque setting with a farm house, dwarfed by a large mill in a field setting, and we took quite a large number of photos although we went on a day when it was not open so was a field away photographing from outside the entry gate. The top picture is a slightly cropped version of the general view from the road, there are few obstacles so you can move along the side of the busy road taking a range of angles. The lower photo was taken from a side road that gets you to about the same distance at the rear of the mill. There is a footpath that goes down the main drive at the front and through the gate by the mill, the gate is shown in the lower photo, so if I had been aware of this at the time I could have got some additional shots. This is a photogenic setting and one that I would like to visit again, now I am aware of the layout and footpath. You need to check the opening times if you want to go inside, as its not like the commercially run mills in the area and open most days, this one is open only a small number of days, each week. Of course if it is open you may then have a problem with cars and people in the way. Half a mile west of the village of Sibsey, off A16, 5 miles north of Boston. Own parking when open. Main road outside is busy but there is room to stop outside its gates when shut. Side road is nearby. March to October, Saturdays & Bank Holidays 10.00–18.00; Sundays 11.00–18.00. May to September, also Tuesdays 10.00-18.00. November to February, Saturdays only 10.00–18.00. Closed between Christmas and New Year’s Day. National Mills Weekend Saturday 10.00 - 18.00 and Sunday 11.00 - 18.00.